UPDATE! This is now available to buy from the links below! Just a quick heads up to say that this useful guide is being released next week (9th July). It's a short read but contains plenty of useful information for anyone coming to Iceland or planning to come to Iceland. My extremely talented wife put it together and of course I'm biased in saying that I think it's great! 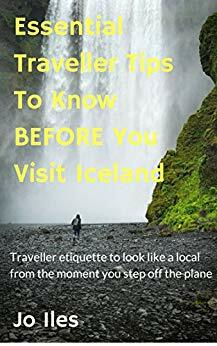 It's called "Essential Traveller Tips to Know BEFORE You Visit Iceland" and it's currently available for pre-order as an ebook from Amazon. There are many blog posts and videos about breaking the rules in photography. This post isn't actually about this. I personally believe that you should use or not use whatever rules you want to create images that you like. No, this blog is about some of the rules and guidelines that we have in Iceland that are worth knowing about before you visit. I have picked a few common ones that I feel are the most important to be aware of. When people ignore these or break them they make national news here so they're not insignificant. ...or ignore the signs restricting access to these areas. At many of the tourist locations you will come across areas that have been closed off. These can be marked by a simple sign or small rope barrier. Whilst they may seem easy to circumvent, and the area closed off may call out for you to hop over that rope, please don't! There are two main reasons these areas are closed off. For your own safety. The changing landscape here can mean that once safe footpaths may have eroded and may lead to a dangerous cliff, crevasse or other peril. In areas where there are geothermal hot springs for example, the ground can be extremely weak and the possibility of falling through into a vent is real. Honestly, even if you think the area looks safe, if it has been closed, please do not ignore the signs. For the protection of the wildlife. We have a very delicate ecosystem here in Iceland. The extreme weather and wild swings between seasons means that there are only small windows for the wildlife to do what it needs to survive and flourish each year. As such, the authorities often mark areas off as being closed for the protection and regeneration of an area. Or they may close an area where there are nesting birds (usually July to September). Unfortunately, with the larger number of visitors to Iceland, areas are becoming damaged faster and for longer. Therefore more and more areas are being closed to allow them to regenerate. I appreciate that people visit Iceland on once-in-a-lifetime trips and therefore finding one of the most popular areas closed can be frustrating. Please note that if you decide to ignore those closures, your once-in-a-lifetime trip can have much longer term consequences for the vegetation and wildlife here. For example, the moss is extremely delicate, takes many years to grow and just the simple act of walking on it can be enough to damage it for decades! I always take care, even when walking in marked areas, to avoid standing on any of the vegetation here. This may seem like obvious advice but it still happens. This is also something that is split into two areas. Firstly, don't ignore the signs if it says that the road ahead is closed or impassable. This happens most often during the winter when some of the smaller roads are not cleared and the authorities just close them. Some of these closures are only marked by a small bollard which is seemingly easy to get around. Please don't! Our fantastic rescue service has been far too busy in recent years as people have found themselves in difficulties. Even some of the major roads can quickly become dangerous in difficult weather conditions so try to imagine how bad a road can get for it to be closed off for 6 months. I am currently still waiting for one road to reopen nearby here. You can see it marked on the image below. I know this road and it's bad even when it's open. Considering that it's now late May and still hasn't opened, it must be pretty awful. As desperate as I am to get to a location along here, I will wait until it goes green before even trying it! For the best up to date information on road conditions in Iceland, please visit: www.road.is. I have also written a separate blog all about driving in Iceland here. The second thing I'd like to mention about driving is to please stick only to marked roads and tracks. There have been quite a few controversies over the years here where people have taken their cars off roads and onto beaches or other areas to either get somewhere or just have fun driving about. As with ignoring closed areas, this can be dangerous for you and damaging to the environment. I actually contacted one influential photography YouTuber, Peter McKinnon, about this after he posted up a video of them driving off road to the plane wreck on the south coast. He removed this footage from the video after I pointed out the potential damage he could have caused. It may have looked like great fun but he was bouncing and driving over areas where Arctic Terns are known to nest. This may go hand-in-hand with not ignoring signs but I think it's deserving of its own mention. There are two very popular locations (among many) where it's possible to visit black sand and pebble beaches. These are Reynisfjara in the south and Djúpalónssandur in the west. At both of these beaches there are big, clear signs warning of "sneaker waves". There is an article about this written here by Guide to Iceland detailing a fatality caused by these waves along with some other very useful information. There have been more accidents since then too. These places are incredibly popular now and on every visit I have seen people chasing the waves or getting too close. Please take the signs seriously and don't go near the sea, even if it looks calm. I know I have written "don't do this or that" or lot in this post but I thought it was important to provide some useful information on why some of these rules, warnings or guidelines are out there. I have spoken to a few visitors who didn't even realise why crossing a rope was a bad thing and were pleased to have been made aware about the potential danger/damage it could cause. My advice is to follow the rules. They are there for your safety and to ensure that others can enjoy the environment in the future. If you want to visit locations that are off the beaten track or that aren't marked, hire a specialist guide or take a tour that safely lets you explore these areas without damaging you or Iceland. Alongside photography, I have another passion: aviation. Aircraft and flight have always fascinated me and it was part of the reason I decided to study Aerospace Engineering at university. It isn't often that I get to combine my two interests but last June, we decided to pop down to Reykjavik Airport and visit the Reykjavik Airshow. I took along my camera of course. Reykjavik Airport is slightly unusual in that it is just on the edge of the city centre. Therefore in the right weather conditions, when you are in town, you will often see and hear the Air Iceland prop planes roaring very low overhead as they go in to land. For the airshow there is lots of parking around the airport area although there are traffic queues to get in. I'd actually recommend parking in town and taking the nice walk over to the airport which will probably take about 20-30 minutes. Entry to the show was free and once in the airport grounds there were a number of static aircraft on display. There were aircraft with tundra wheels, presumably for those pilots wishing to explore difficult to reach areas of the country. There were also a number of aerobatic aircraft including some impressive bi-planes. Keilir Aviation Academy sent two of their pilots and one of their Diamond DA20 training aircraft along - I have been lucky enough to go up in one of their bigger DA40 aircraft for a flight around Reykjanes. You can see a cheesy YouTube video of this here: Flying in Iceland. All the aircraft were accessible with some open to allow people to sit in the cockpits. There were also companies showing off their impressive film drone collections. Alongside DJI consumer drones were some incredible eight prop professional filming drones. In the early afternoon the air display started. It was pretty impressive for such a small show. Small private aircraft did fly pasts, sometimes in formation. There were aerobatics which looked impressive against the backdrop of the city. And then there were the stars of the show, the Icelandair aircraft. Icelandair had two aircraft there for the show. First was their DC-3 which Icelandair introduced into their fleet in 1946 and flew them right up until 1972! This aircraft is painted in the current Icelandair colours and I particularly like the yellow engines. I was stood behind the aircraft on start up and the engine backwash was fearsome! It was lovely to see this old aircraft flying over the city. Next up was Icelandair's Boeing 757-200 Freighter. Icelandair has long been using 757 aircraft as their workhorses capable of flying short and long haul. This year they have started to introduce the new Boeing 737-Max but the 757 will always remain my favourite of their aircraft. We were stood right next to the aircraft and watched the pilots prepare for the display. The engine start up was predictably loud, the Rolls Royce engines making an impressive racket. AVGeek fact - the engines are the same as those on the Boeing 747 (which has 4) and as such are very high powered for the size of the aircraft. This can be felt most on take off in certain conditions when the plane literally feels like a rocket! The aircraft performed some impressive fly pasts, especially when at high speed. It was hard to capture in camera but they put on a great display. Last up (or was it? See below) was the Canadian Airforce CF-18 Hornet. This was easily the noisiest aircraft of the day and the hardest to photograph as it was going so quickly. In fact, I messed up my camera settings (turned auto focus off by accident) so didn't get many in flight shots. I have instead shared the annoyingly well captured silhouette that my wife took...on her iPhone! That was supposed to be it for the show and we all started to make our ways to the exits. Suddenly, however, everyone noticed a growing roar and looking out over the city, a purple plane could be seen making its way to steal the show. Yes, young Icelandic airline WowAir was coming along to conduct their own (unplanned) display of their Airbus A321 aircraft. For the next 5 minutes it performed some maneuvers that (cough) wowed the crowd in a blatant but fun attempt to outdo rival Icelandair. I have to say I was impressed with the performance of the Airbus and the purple colour scheme looked great in the light. Well played WowAir, well played. And that was it for the show. The private owners started moving their aircraft out for their flights home. It was nice to watch them getting ready and saying goodbye to everyone. I particularly liked seeing what I assume was a father and son heading off together. The young lad will one day realise how lucky he is to have had these experiences at such a young age. It was a great little airshow, more so because it's open to everyone and absolutely free. They have announced the date of Saturday June 2nd 2018 for the show this year so if you find yourself stuck for something to do in Reykjavik and want to have a bit of fun, I highly recommend the heading to the Reykjavik Airshow. One of the best ways to see all the amazing scenery we have to offer here in Iceland is to hire a vehicle and head out onto the Icelandic road network for an adventure. It is worth remembering that driving conditions in Iceland can be extremely challenging both in terms of the changeable weather and with regards to the roads themselves. This article is designed to provide you with information on how you can stay safe when driving in Iceland. The Icelandic Met Office website is the best source of information for the weather. You should bookmark this website on your phone, laptop and tablet and become used to checking it as part of your daily routine when in Iceland. Weather warnings, particularly for high winds, rain and snow, are common during the autumn, winter and early spring. If there is a weather warning out for your area of travel on a particular day, please pay attention to the advice on the page. If travel is not advised, don't risk it! There have been incidents where the wind has been strong enough to shatter car windows. Also keep in mind that conditions in Iceland change quickly! Regularly checking out this site during the day will help you avoid any nasty surprises. You can also use this site to check for the Aurora forecast as well as information on earthquakes currently happening around the country. Another website to have stored when you travel here is www.road.is. This is the most up-to-date source of information on driving conditions on all the roads in Iceland, including the highland and non-paved roads. The Iceland map on the homepage is split into the different regions. To check the conditions where you will be travelling on a particularly day just click that part of the map. You will then be taken to a detailed road map of that area which is colour coded - the codes are explained below the map. Definitely don't drive anywhere marked as red! Many of the roads also have webcams. You will see little boxes of information including temperature, wind speed and wind gust (with the little arrow next to it - red arrow is strong gusts). Clicking this box will take you to a page for that road itself. If it has webcams you can check these out to see what the roads look like. This has helped me on a number of occasions in the winter, after heavy snowfall, in being able to plan my journeys to avoid the roads that are in the worst condition. This is a website with lots of useful information on travelling safely around the country, not just on the roads. On the front page you can register your Travel Plan with the Icelandic Association for Search and Rescue. This lets them know where you will be - you can even turn on Trip Monitoring with them for extra safety. They offer an app for iOS and Android which allows you to call the emergency services by pressing a big Red Button, direct from the app. You can also check in your location on the app with the services so that if anything happens they have more information to work with - the last 5 locations are stored and they are happy for you to use it! As they say on their site, you are not disturbing anyone! There is a lot of other information on this site including useful driving tip videos and information on everything from camping to kayaking. I would highly recommend having a read through this website before you arrive in Iceland or before you set out on your big adventure. It's a great resource. This may sound like obvious advice but there are a lot of tempting side tracks leading off to mysterious looking places. These could be simple farm roads where the worst thing that could happen is the farmer wonders who is driving up to see him/her. Worst case you can end up on a poorly marked track that is not maintained or suitable for the vehicle you have. Even some of the main roads during difficult weather conditions can become extremely difficult to drive on so these smaller tracks and roads are just not worth risking unless you are with an experienced guide. I know, it's tempting. You round a bend in the road and suddenly the scenery opens up into something spectacular and you just have to take a photograph. Whether you are on Route 1 or a smaller side road, please do not stop your car on the road, or even with part of the car on the road, to get out and take a photograph. I cannot stress how dangerous this is. Whilst the roads here may seem quiet compared to other countries, there is now much more traffic than there used to be. Sure, as a kid in the 80's here we would be guaranteed not to see another car on Route 1 sometimes for up to an hour. I'll admit back then it was possible to stop and take photos and even have a picnic. But times have changed! What may seem like a quiet road, with plenty of time to stop for a photo, may suddenly be filled with tour buses or cargo lorries, all of which will have to slow or even stop if you are blocking the roads even a bit. You may wonder what the big deal is with this but unfortunately people have been killed recently when stopping to just take a photo. I highly recommend finding a safe stopping place, of which we have MANY, a bit further on and pulling off the roads entirely. I mean giving yourself lots of space! Then feel free to pop out and grab that shot. I would say that this perhaps is the piece of advice I hope you take the most seriously as it is becoming a problem. I hope this post has been useful. Being prepared for travel on the roads in Iceland is essential and will ensure you have both a safe and enjoyable trip. What I recommend in this article takes all of 5 minutes here and there during the day and will minimise your chances of getting into difficulties. If you do have problems, the Icelandic Association for Search and Rescue are there to help. Please do keep in mind that they are a volunteer organisation and rely solely on donations. So when they are called out to rescue someone who hasn't checked the road conditions, and found themselves stuck in a snow drift, they are often coming to help voluntarily. They are often risking their own safety in these situations. Therefore please consider giving a small donation to the organisation as part of your trip to Iceland. I know they would be extremely grateful.